Every tear that your heart sheds is a golden drop of sun. I weigh each one in my heart of hearts not knowing from which they all come from.I drink the fluid that runs from your eyes knowing you better with every drop. The most obvious confirmation that we are in fact moving in and through the door way to our deeper beings are our vulnerable tears. Not the tears of self-pity, but the simple welling up feeling that almost always accompanies the crossing and crisscrossing of the barriers between the heart and the head. These tears are more like a divine fluid. 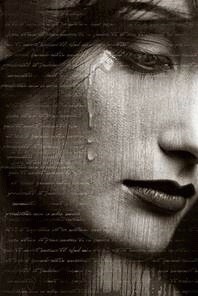 The tears of the heart are precious and the pure in heart always cherish the liquid river of tears.